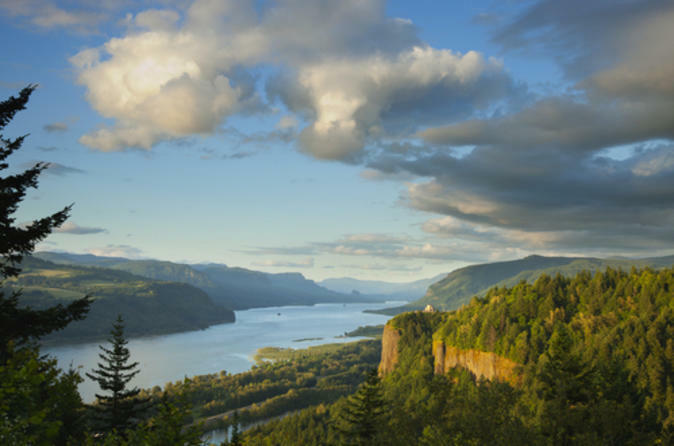 Your journey starts on a 45-55 minute drive to the Historic Columbia River Highway. On the way, stop to take photos of scenic vistas. When you arrive the Columbia River Gorge, hop on your bike and follow your guide on an easy, 6-mile (9.5-km) ride along gentle hills. This ride will give you a sense of what it was like to travel along the country’s first National Scenic Highway. You’ll make several stops at waterfalls to embark on short nature hikes, where you’ll feel the cool, pulsing mist of water from amidst the lush green forest. Keep an eye out for native birds such as osprey and bald eagles. Small snacks are available throughout your tour, and you may also bring food and drinks with you aboard the van. After soaking in the Pacific Northwest’s famous natural landscapes, you’ll be taken back to Portland.